Year, 250 Hour/year Lease Commercial use only. w w w. s e m a e q u i p . c o m Offers expire April 30, 2019. Financing options subject to approved credit by John Deere Financial. Some restrictions apply; other special rates and terms may be available, so see your dealer for details and other financing options. Available at participating dealers. Prices and models may vary by dealer. Valid only at participating US Dealers. Attachments pictured are extra unless otherwise stated. Let Us Help You With Your Easter Meal! Call or Stop in to order delicious baked goods and/or salads! Monday: Taco Bar | $1.50 per Taco Soft or Hard Shell Taco with Beef and Cheese Tuesday: Burgers or Brats $2.00; Onion Rings or Fries $2.00 Wednesday: 60¢ Wings, $8 Pitchers of Beer, $1.50 Ribs Thursday: Steak Special or $3 Nachos Special; $2 Margaritas; Drink Specials 9:00 pm-close Friday: Fish Plate or House Smoked Meat Plate; $2.75 Domestic Bottle Beer 5:30-7 pm; Salad Bar included w/Entree or a-la-carte Saturday: 8 oz Steak with Grilled Shrimp and Soup & Salad Bar Sunday: CLOSED for Easter! A Heartfelt Thank You to my family, friends & all those who donated their time and gifts and all who came to my benefit on February 2nd, 2019. I will be forever grateful for your love, support and generosity! reunion and it is always fun to see everybody. Sat, April 20th, 2019 2:00 p.m. - ? Wed, Apr 17: Burger Night 5:30-8:00 pm Thur, Apr 18: Lasagna Dinner; Bingo 6:30 pm Fri, Apr 19th: Shrimp Popper Basket Dinner Sat, Apr 20: Bar Bingo 2 pm; Evening- Riviera Supreme Dinner; Lost Faculties Band 7:30-11:30 pm Sun, Apr 21: CLOSED FOR EASTER! Food, Fun & Games ​ ​ll proceeds help to support our veterans A and our community. ​O​pen to the ​p​ublic. 12-4 pm 107 11th St N. E. Austin, MN 55912 Food & beverages provided. No Gifts please. Walk-in or schedule an appointment with Same Day Clinic. For hours, appointment information and a list of conditions treated in Same Day Clinic, visit mayoclinichealthsystem.org, select Austin and click on Same Day Clinic under Services & Treatments. Mayo Clinic Health System in Austin Call 507-433-8758 to schedule your Same Day Clinic appointment. Keeping Austin looking good for 25 years. We get into backyards where trucks can't go! Looking of a part time driver to make local deliveries as needed in the SE MN area. For more information contact Krueger Trucking 507-437-4636. Stewartville Care Center is seeking a qualified individual to join our Nursing Department as a Scheduler! The successful candidate will have high ethical standards, sound judgment, excellent communication skills and a desire to make a difference for our residents. Responsibilities include maintaining current nurse scheduling process with utilization of ShiftHound and the coordination of contracted nursing (pool) for the Care Center. The applicant will preferably have clerical skills and customer service experience with computer knowledge; or have 2 years of office experience. A comprehensive benefits package is available. Stewartville Care Center wants to maintain its Five-Star Staffing rating for nursing homes set by the Centers for Medicare and Medicaid Services. We are dedicated to serving older adults by providing skilled nursing, comprehensive therapies and residential services to Stewartville and the surrounding areas. To apply visit: www.stewartvillecarecenter.com and apply via web application or come into the Business Office and grab an application. You can also email resumes to: kschwartz@stewartvillecarecenter.com. Stewartville Care Center and affiliates are an Affirmative Action employer. Assisting each individual in the activities of work and community living. Cedar Valley Services is seeking full time DSP II’s at our main 4th St. location and Top Flight downtown. Responsibilities include assisting adults with developmental disabilities including personal cares, training of basic work skills and transportation. HS diploma or equivalent is required and experience and/or knowledge of working with adults who have disabilities is preferred. This position requires the ability to work independently and meet the physical demands of the job. NO NIGHTS/HOLIDAYS/WEEKENDS. Excellent benefits package. Valid MN Driver’s license and vehicle insurance required – must have clean driving record. Background check required. Please email resume to hnewman@cedarvalleyservices.org or apply in person at 2111 4th St. NW, Austin. CVS is an EOE/AA employer. CRC is Growing! Apply Today to Join Our Team! Full and Part-time hours available.Work every other weekend and holiday; flexible schedules. FT & PT BILINGUAL AND NON-BILINGUAL CUSTOMER SERVICE REPRESENTATIVES Start your career with CRC today! Competitive wages starting at $11.00+ increase after 90 days!! Shift Differentials up to $2.00 EXTRA per hour! Earn up to an additional $10/hour during peak events! Bilingual differentials offered also! Benefits Offered to All Employees, including Health, Dental, Vision, Life, Disability Insurance and much more! Apply Today! Training classes starting in April and May! EMERGENCIES HAPPEN! Heart Attacks! Choking! Full Time Production Great Place to Work! CMG is hiring for 2nd shift production positions. Great performance is rewarded. Excellent vacation pkg, paid 8 hrs for holidays, medical & dental available. If you are looking for a company that you can grow with, this is a great opportunity!!! PART-TIME RUNNER/ FILE CLERK Position responsibilities include: Bringing documents to/from our office to other downtown locations, including the courthouse and post office; maintaining office files; and other office work as needed. This position requires an organized person who is attentive to details and likes to take walks. Possessing a valid driver’s license is helpful but not necessary. 10 hours per week in the afternoon. Local Class A Driving Job McFarland Truck Lines, Inc.
located in Austin, MN is looking for full time local drivers and part-time weekend local drivers. Call today for an excellent hourly pay opportunity. We offer a complete benefit plan for full time positions. Candidates must have the following: • A valid Class A CDL • A good driving record • Experience in trucking To apply, please call 507-437-6651 ext. 202 for Craig Steinfadt. We are an equal opportunity employer. with an Exciting New Career! 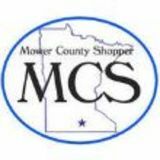 Start a fast paced job as an Account Representative at the Mower County Shopper. • Tickets available at the CVB or Chamber Drawing on Saturday, May 11, 2019 at 7:00 pm at Wedgewood Cove. Need not be present to win. Must be 18 or older to purchase tickets or win prizes. Winner responsible for all applicable taxes, license and fees. Cash or Check only Permit #X-94272-19-01. 2 & 3 Bedroom Townhomes. Rent based on income. Credit Check & Criminal Background Check Required. IN SPECTACULAR WOODED SETTING Overlooking Turtle Creek rests this almost new, quality built, custom designed 6BR 5-bath home. Nothing spared with special features galore & 5500+ finished square feet. BEAUTIFUL MATURE TREES Surround this custom designed 4BR 2-bath home on 1-acre city lot overlooking East Side Lake. Hardwd flrs, 2-fireplaces, spacious rooms, deck, porch, c/a & dbl att garage. BUSINESS OPPORTUNITY Excellent 2-Story downtown building with 17,000+ square feet with both office pace & warehouse space. Has full basement & rests on corner lot with parking for 50 vehicles. IN LOVELY, QUIET SW AREA You’ll find this quality built 4BR 4-bath 2-Story. Has main flr family rm, office/den, dining rm, new kitchen, game rm, master bedroom suite, main flr laundry & 2-fireplaces. DELUXE SENIOR LIVING With your security & care free living in mind. Check out this 1BR 1-bath unit at the Village Co-op w i t h excellent open floor plan, private balcony & wonderful common areas. SUCCULENTS - Huge Variety Snapdragons, Pansies, Violas! CONVENIENT SW SPOT For this affordable, quite spacious 3BR 3-bath Colonial. Has hardwood flrs, big living rm, dining room, rec room, vinyl siding, central air, attached garage & all appliances stay. 507-437-6554 • 2101 4th St NW, Austin FRESH BAKED DAILY! BUILDING OPPORTUNITIES Two commercial lots, each $49,900. 5031003 & 5049023. NW lot with trees. $37,900. 5048418. 4-acre NE, water view $85,000. 5032069. Spacious SW lot in quiet SW spot. STUNNING COLONIAL This 4BR 4-bath home has formal dining, eat in kitchen, main flr & LL family rms, mstr bedrm suite, bonus rm, heated double garage, shed, fenced lot, patio, gazebo & deck. Please consider donating your time, talents or money to these local organizations. We are now located at 401 N Main Across from the Spam Museum Hours: Monday-Thursday: 7 am-5 pm; Closed Friday Ahora estamos localizados en la 401 N Main, enfrente del Museo Spam. Nuestro horario es de lunes a jueves de 7 am a 5 pm y cerrado los viernes. Family! The Governor’s Fishing Opener is coming to Albert Lea for the first time ever, and you can be a part of it! Gather your friends and join in the fun! enjoy beautiful albert lea! Thank you to all of our friends and family who attended our Dad Rolland Brady’s funeral. Your gifts and kind words meant a lot to us. Third Annual Vending Event Mark your Calendar! Sun, April 20th, 2019 • 9AM - 2PM Holiday Inn Ballroom, Austin Great way to support local vendors and the Salvation Army World Series. Grab some great gifts for Easter and Mother’s Day. After shopping, stop into Torge’s for lunch! If you’re sick of not having enough storage, call the building experts at Northland Buildings! Save over $2.00 per Gallon! and some pharmacy transactions. Total does not include tax or deposit. Please see stores for details or go to Hy-Vee.com for full terms and conditions. Fuel savings are limited to 20 gallons of fuel per purchase, per vehicle. While Buy one, get one supplies last! L selectA varieties • 7 to 15 oz. Exclusions apply, including but not limited to money orders, money transfers, prepaid debit cards, lottery tickets, gift cards, tobacco and some pharmacy transactions. Total does not include tax or deposit. Please see stores for details or go to Hy-Vee.com for full terms and conditions. Fuel savings are limited to 20 gallons of fuel per purchase, per vehicle. select varieties • 750 ml. 1.48lb. .99lb. THE MORE YOU BUY, THE MORE YOU SAVE! 6301 University Ave., Cedar | 266-7535 puffcorn or Falls pretzels 2834 Ansborough Waterloo 233-3266 select Ave., varieties • 7 to |15 oz. $ and some pharmacy transactions. deposit. Please see stores for details or go single to Hy-Vee.com for full terms bottle purchase Hormel Always Tender Total does not include tax or from Washington 14.99 and conditions. Fuel savings are limited to 20 gallons of fuel per purchase, per vehicle. Prices effective Monday, December 10 17th , 2018 only. While supplies Buy one, get onelast! with purchase of 7 While supplies last. Products vary by location. We reserve the right to limit quantities. Old Dutch 6301 University Ave., Cedar Falls | 266-7535 puffcorn or pretzels 2834 Ansborough Ave., Waterloo | 233-3266 Whole boneless loin select varieties • 7pork to 15 oz. VALID ONLY APRIL 18 & 19, 2019 Limit 1 coupon per customer. FREE 10/$10 $ discount. FREE FREE Coupon must be presented at checkout to 10/ receive 10 $ 7/ 10 7/$10 9.99 $ 12.99ea.Excludes 12.99 ea. 9.99 ea. 3/Spirits, 5 Western Union, Postal, ea. Tobacco, Lottery, Wine and 1.48lb. .99lb. .99lb. select varieties • 7 to 15 oz. 7/$10 12.99 ea. 10 3/ 5 1.75 Qt 9.99ea. 1.48lb. .99lb. THE MORE YOU BUY, THE MORE YOU SAVE! 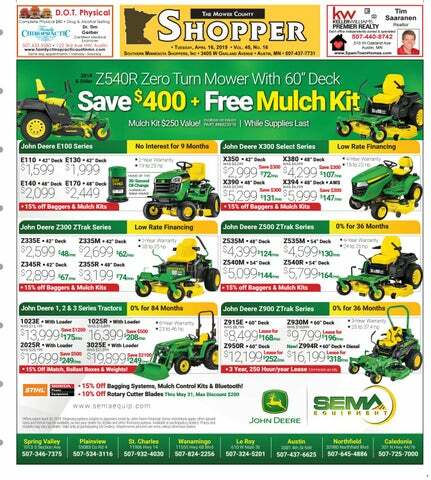 The Mower County Shopper is published every Tuesday. It is a free publication out of Southern Minnesota.